We'll assume that your Internet was working at an earlier point. If you are setting it up for the first time, the steps listed below were not designed with that purpose in mind. You need to follow the instructions that came with your router or modem. I've included a series of definitions for the terminology used on this page. Your software is misconfigured for access to the Internet. If the issue is with your ISP or with access to Internet in your area, you'll just have to wait for the problem to be resolved. Progress through this page to process these alternative solutions. I've presented them in the order I'd likely progress if I were to be assessing the problem and looking for solutions. A network is a collection of computers and other devices connected and talking to each other. Most connections are via a router and provide you with access to any other devices connected to your network as well as to the Internet. The Internet is a network. If you are using public access from a connection that you don't control (something other than your home network) or one that isn't secured properly (you haven't changed the default passwords or enabled security) then you are placing your computer and data at risk. Everyone on an insecure (public) network such as a coffee shop can potentially “see” the information you are sending and received on that Wi-Fi service. All it takes is some software that is easily obtained on the Internet. NEVER do Internet banking or similar risky activity on a public network. Cellular service is more secure than free Wi-Fi. It is important that you secure your own network. It is beyond the scope of connection issues, but there are resources on this site that will help you to do that. You might wish to review basic computer terminology and Windows terminology to better understand how they are involved in connecting to the Internet. A network is a collection of computers and devices that are connected together, allowing them to share information. A local network refers to the network served by a single router in a specific location. The Internet is a world-wide network. The Internet is a network that spans the globe. Most people connect to the Internet either via their home or work network (router) or via a free wireless service provide by a coffee shop or community broadband service or via their cellular provider. ISP refers to the company that provides you with access to the Internet (Shaw, Telus, Bell, etc.). An IP address is usually represented with a numeric series of numbers separated with dots (e.g. 192.168.1.1). Every device on your local network (and on the Internet) has an IP address. A domain is the main address of a website (e.g. google.ca). There are also subsets of domains such as sites hosted on WordPress or Blogger (e.g. russ-rants.blogspot.com). A service converts the domain name into the IP address that is the actual location on the Internet. The following describes the common methods used in connecting to a network, including the Internet. A Local Area Network (LAN)is wired connection to a common router. A Wireless Local Area Network (WLAN) is a wireless connection to a router. A cellular network is a wireless connection to a cellular service (Rogers, Bell, Telus, Fido, etc.) rather than via an ISP. The following describes the hardware involved in connecting to a network. A router combines the splitting power of a network hub with the ability to protect you with a hardware firewall. Most current routers include both wired (LAN) and wireless (WLAN) connections. 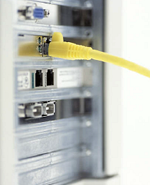 A network adapter connects your computer to the network and can be LAN or WLAN adapters (laptops often have both). A modem can generally refer to either cable or ADSL modems that connect you to the Internet. Most current modems provided by your ISP are combined with a built-in router. Dial-up modems are mostly obsolete but were once the primary method of connecting to the Internet. A (web) browser is a program used to view web pages on the Internet. Choose your browser carefully. A email client is a program used to send and receive emails and to display them. Webmail is an online service that allows your to view your emails via a web browser. Gmail is one example. A FTP client is a program used to upload websites to the server where they can be viewed on the Internet. An app is a specialized program used to view content from a specific source. Apple, Microsoft and Google have app stores that provide applications for their various operating systems. SpeedCheck can test how fast your Internet access is and provide some solutions for resolving issues. In some cases, an ISP like Shaw may be delivering full speed Internet into your neighbourhood, but high-volume users may be sapping the bulk of the available bandwidth. If you have no Internet access a series of troubleshooting steps will help to determine where the breakdown is and how to resolve the problem. When your Internet service is disrupted, there can be many things that have gone wrong. The best way to start is to determine if everything is broken (i.e. you can't access any websites or Internet services) or if the difficulty is only with a certain program or a specific website not responding. Go to Is It Up? and enter the domain of the site you're looking for. Is It Up will check to see if they can connect. If they can and you can't, the issue is either with you or your ISP's connection. Sites go dead for a variety of reasons and the issue may be temporary. If you see a 404 error (“page not found”), it means that the site is up but the page you requested is not available. If you are able to view local content but cannot see sites hosted across the country or elsewhere, there could be a blockage in the Internet grid. Have a look at The Internet Traffic Report which monitors the flow of data around the world. You can view data for specific cities, helping to pinpoint potential problems. These are issues with the Internet itself and there is little you can do but wait it out. If your email works fine but your problem appears to be related only to your web browser, have a look at Browser Problems. If you can surf the Web okay, but you have difficulty sending or receiving email, have a look at Email Problems. If you have more than one computer, see if both computers are experiencing difficulties accessing the Internet. If the second computer has full access then your problem is localized to the first computer (you can skip any tests that don't deal with the computer itself). Try rebooting your computer to see if that fixes the problem. You'd be surprised how often that simple step resolves issues. If restarting your computer or device doesn't work, you'll have to verify each potential problem to verify that it is or isn't the problem until you restore access. Where I refer to your router this may be configured as a separate high-speed modem connected to an external router or as an all-in-one combined modem/router supplied by your ISP (most common). If the devices are separate then both need to be reset when you are instructed to reset your router in the steps listed on this page. Use the reverse sequence when restoring power. A separate power bar with only the two devices attached simplifies matters. The following steps assume there is NO Internet access. Specific websites and ISPs can have outages that have nothing to do with your computer or its settings. Try the following series of steps, in order, to see if this fixes your problem. You can stop when you resolve the issue(s) you are having. Check the network icon (or wireless connection settings) to see if you have Internet access. Ensure that your network adapter is not turned off. Check for changes to proxy settings. Check the network cables if your computer is wired to the router. Check your firewall or security software. There are specific troubleshooting steps for ZoneAlarm issues. Check your browser access issues or email problems. The next few sections will expand these steps into a series of instructions. Where Linux is indicated, I've based these on Linux Mint, the version I'm currently working with. Check the network connection on your computer. This connects other computers in your network as well as providing access to the Internet via your ISP. Depending upon your operating system and your settings, there may be a network icon at the top or bottom of the screen or it may be hidden. Your Internet connection can include either or both wired and wireless connections (see terminology). Whichever you're using, there is likely a router involved, whether it is your home network or a public network such as at a coffee shop or a business network, or a community wireless network). If you're not using your own network, you'll need to speak to the person responsible for that network for details on how to fix any issues. If you're connected wirelessly you'll see a listing of available wireless networks. The wireless network you're currently logged into (if any) should be indicated. Most networks are protected by a security protocol and a password. You'll need to verify that your connection is strong enough and that the settings don't indicate any problems. If you're having difficulties connecting or if there is a problem with the connection, you'll need to diagnose it. If you don't control the network, you'll need to ask for the password and may need additional help diagnosing the problems. Some public networks are heavily used and can be very slow regardless of whether everything is working fine. Check the cables to ensure that they aren't unplugged or damaged. Be sure that the network adapter isn't disabled. You may need to reset the router then reboot your computer. The following are specific to each operating system. If you're isn't listed, look for your computer or device documentation. White is normal but you may only have access to the network (but not the Internet). Red indicates that there is no access to either the network or the Internet. Click on Open the Network and Sharing Center which should open a new window. If there isn't, click on Troubleshoot problems and follow the prompts. Windows 10 users can click the network icon to see the status of your Internet connection(s) and to connect to listed Wi-Fi networks. Look for the word “connected” for both LAN and WLAN connections to ensure they are working correctly. Label the network a metered connection if you have a limited data plan. You can also change other properties here and troubleshoot problems using the network troubleshooter. Enable or disable a network adapter. Add a VPN or manage other services. Open the Network Preferences from the WLAN icon or look in the Systems Preferences to see your network connections. You may have active connections for Ethernet (LAN) and/or WiFi (WLAN). If everything is normal, you should see “connected” indicated in the appropriate location(s). If not, click on Assist Me at the bottom then Diagnostics on the dialogue box that appears. Follow the instructions for the connection that is having problems. under Preferences (Network Connections: manage and change your network connection settings). You'll need to unlock the Network Settings with the Administrator password to make changes. How to solve Internet problems might help you to resolve issues. How to fix your Internet connection in Ubuntu Linux (Mint is based upon Ubuntu). 13 Linux network configuration and troubleshooting commands. Linux network commands used in network troubleshooting. Mobile devices can connect via both wireless networks and cellular networks (smartphones and cellular-capable tablets). At least one must be enabled and have access to an available network to use the Internet. Look under setting for the Wi-Fi and cellular (where available) settings. Ensure that Wi-Fi or cellular is enabled. Ensure that airplane mode is NOT on. Ensure that Do Not Disturb is NOT enabled. Most users should not touch the proxy settings, leaving them at the default which is System Settings. However, changing the proxy settings can disable Internet access and is something that many unwanted infections do to maintain control of your computer. Each browser has proxy settings but most make the changes in the System settings. If you're in an office where your computer is provided by your employer you'll want to verify the settings with whoever is responsible for the network). It is generally not recommended that users change these, but it is possible your Internet connection isn't working because something else changed the proxy settings such as malware or a program installed by a scammer (more here…). Windows users will find these in the Internet Options. Click on the Connections tab then click the LAN Settings button. Only Automatically detect settings should be checked. Uncheck Use a proxy server for your LAN then verify that you have Internet access. Mac users will find these in the in the System Preferences. Click on Network then Advanced and choose the Proxies tab. Normally none of the options should be checked other than Use Passive FTP Mode at the bottom. My computer also has *local, 169.254/16 under Bypass proxy settings for these Hosts & Domains. Linux users will find these settings in the Network Proxy Preferences (click on Preferences then Network Proxy). The default should be Direct internet connection. The troubleshooter may prompt you to check the router settings, but first you'll need to ensure that the network cables are firmly attached and that your modem is connected to either the cable outlet or the phone line (depending upon which ISP's service you're using) and that the cables are not damaged. Check the connections at both ends of all the wires. This may sound silly, but things get pulled or simply break. Check the connection to the cable jack or phone line as well as the CAT5 or CAT6 network cables between the modem and/or router as well as the computers. On most systems there should be a green LED lit if the network cable connection is working. Try replacing the cables. If the connector retainer (a small, springy plastic that holds the cable firmly in place) is broken or has lost its ability to retain a firm connection then the connection may be weak or intermittent. If instructed by the network troubleshooter (or if you've completed the steps above) you'll need to ensure that the problem isn't with your router. Turn off the power to the modem (then the router), and wait for two minutes. Turn the modem on and wait for the lights to settle (you should see a steady light on the modem) then turn on the router. This process will force a new IP lease from your ISP and everything should now work. Recycling the power is necessary because your ISP (Shaw, Rogers, Telus, etc.) changes dynamic IP addresses every so often, disabling those that have been running for too long. I strongly recommend that you purchase a decent power bar to protect your investment in your modem/router if a power surge hits your system. This will allow you to turn off the power to both the modem and router with a single switch. Don't use the $10 variety — replacing your computer, modem, router and associated gear will cost more than that. If you continue to have problems and you have a separate modem you can try your modem without the router. If the Internet is accessible, try to run it with the router again. If that fails, proceed to the next step in resetting and setting up your router. Note: it doesn't take more than a couple of minutes for an unprotected computer to become infected. Be careful while accessing the Internet at this stage, particularly if you are using Internet Explorer. If you continue to have problems, you should try resetting the router. Factory settings are the defaults that came with your router. Resetting your router will remove any customized settings. Make a note of any existing settings before resetting your router (if possible). Many provide a method of saving settings to your computer. Most have a recessed reset button. To restore factory settings, hold down the button for a minute or two with the tip of a ball point pen or paper clip. You will then have to configure your router to set up your network and connect to your ISP. Ensure that your computer is connected to the router with a network cable during the setup process. Never alter your router settings while connected through a wireless connection — you will lose access to the router when it reboots during the setup process. You may wish to have some professional help to ensure you retain the maximum security and correct settings for your network. At the very least you should read the manual provided with your router so you understand the process and what each of the settings will change. You can obtain the instructions for your particular router from the manufacturer's website or from the documentation that came with your router. Never retain default settings as this compromises your network security. Change the default settings (especially the password) to protect your network from malicious attacks. Next, check the firewall and security software for issues then check that software is not misconfigured. The firewall's job is to protect your computer from unauthorized access. If there is a problem with the firewall settings, then your Internet connection may not be working or the firewall may not be protecting your computer from threats on the Internet. You should be using both a security software suite that includes a firewall plus a router (hardware firewall). There is more information about these on the Firewalls page, including why you need firewalls. Determining if your firewall is creating the problem. I strongly recommend a current version of ZoneAlarm Extreme Security. While Check Point offers a free basic firewall for personal use ZoneAlarm Extreme or Internet Security Suite will provide better protection against a multifaceted attack. I'll use ZoneAlarm in the examples below. The testing process should be similar with other firewall products. Your product manual or the company's website should give you more information. Programs like ZoneAlarm are designed to protect you from unwanted and dangerous traffic to and from the Internet. ZoneAlarm denies access to the Internet for everything by default. If you have not configured ZoneAlarm properly, your Internet service might not work or a particular program may not have access. To rectify an incorrect installation of ZoneAlarm, you may need to uninstall and reinstall it. The same may be true if ZoneAlarm is not running at all. There are many programs tracked by ZoneAlarm and incorrectly choosing to deny access could be the source of your problem. Click the ZoneAlarm icon beside the clock to restore the ZoneAlarm monitor. Click on the Antivirus & Firewall box on the left then click on the Settings in Application Control. You should see two slider controls labelled Network firewall and Your DefenseNet. Normally, these should be set to Max and Auto respectively. Try moving the Network firewall to Off then see if your browser has access to the Internet. If you are able to access the Internet with ZoneAlarm off, then the problem is with your ZoneAlarm settings and you should probably do a clean install (to remove any incorrect settings). You'll need to uninstall your Zone Alarm product, reboot, then reinstall using the most current version of the ZoneAlarm product you're using. Be sure to download and install the same version. The license for one product won't work on any other. If the previous test didn't give you access, ZoneAlarm may be corrupted and should be uninstalled. Once ZoneAlarm has been uninstalled, try your browser to see if it has access. Verify with other programs that were unable to connect. If access is restored, then your problem was with ZoneAlarm and you should reinstall it. Otherwise you need to look elsewhere for the source of the blockage of your Internet access. Do not reinstall ZoneAlarm until you've resolved all problems with access (then do a clean install to remove any settings). Incorrect configuration of ZoneAlarm is not the only possible cause for lack of Internet access. One of the Windows Updates that Microsoft released on July 8, 2008 (KB951748) caused ZoneAlarm to treat the changes as a malicious attack on Windows. As a result, ZoneAlarm users were unable to access the Internet. A temporary fix was setting the Internet Zone Security to Medium. Any such issue will be reported in Check Point's support pages or forums. The fact that Internet access was required to learn about this fix means that removing ZoneAlarm temporarily may be your only option. If you have followed the steps to this point and you still have a problem, you'll need to verify that your router is not the problem. If everything else is working, then the problem may be with your software. Generally when this happens you'll be able to access the Internet except with a specific piece of software. The are special sections on the Programs with Access Problems page. Most issues are dealing with browsers and email programs but you may also have problems accessing FTP sites or on-line help in other programs. Check your software documentation or the manufacturer's website for details on how to troubleshoot your particular program. You may need to use another computer or go where the Internet is working if you don't have access.